The Cuker team recently headed north to the Anaheim Convention Center for the 33rd annual Natural Products Expo West. The world’s largest premier tradeshow for the natural, organic, and healthy products industry drew in more than 63,000 industry members and over 2,000 exhibiting companies. We were thrilled to support one of our food clients, Royal Hawaiian Orchards, who was a first time exhibitor. Royal Hawaiian is an exciting new healthy snack brand, featuring GMO free, gluten free, and sulfite free seasoned macadamias and fruit & macadamia crunches. 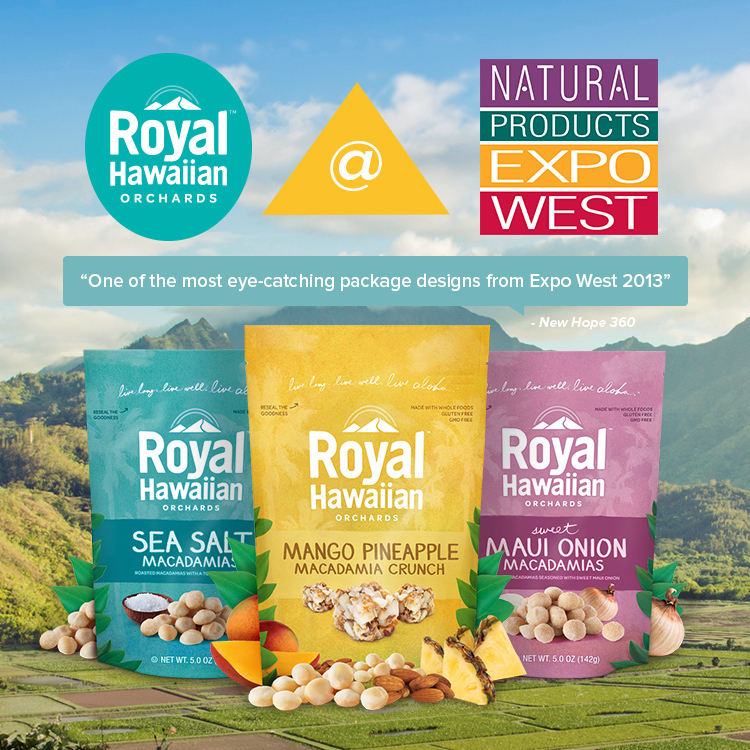 The Hawaiian brand stood out from the rest, and was recognized as one of the most eye-catching package designs at Expo West by NewHope360. Our desire when creating the packaging was to keep it unique, handcrafted, and colorful all while speaking to the authentic Hawaiian character of the brand. It has been a truly humbling experience watching the Royal Hawaiian brand grow from a small company to a national player in the snack food industry. The natural and organic food market is rapidly growing, and we were excited to see the new product launches as well as the established brands’ exhibits. We had a great time visiting the Royal Hawaiian booth, networking, and sampling some delicious natural foods. As self-proclaimed foodies, we are already looking forward to next year’s Expo West! Published on April 3, 2013 .